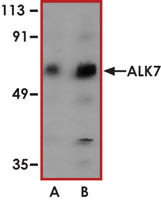 Sample Data :Western blot analysis of ALK7 in human placenta tissue lysate with ALK7 antibody at (A) 1 and (B) 2 ug/ml. Scientific Background :ALK7 is a type I receptor for the TGFB family of signaling molecules in which type I receptors phosphorylate cytoplasmic SMAD transcription factors, which then translocate to the nucleus and interact directly with DNA or in complex with other transcription factors (1). Alk7 was expressed in all insulin, glucagon, and somatostatin -positive cells of the pancreas (2). GDF3 regulates adipose tissue homeostasis and energy balance under nutrient overload, in part, by signaling through ALK7 and Alk7 showed reduced fat accumulation and partial resistance to diet-induced obesity, similar to Gdf3. 1. Bondestam, J. et.al: cDNA cloning, expression studies and chromosome mapping of human type I serine/threonine kinase receptor ALK7 (ACVR1C). Cytogenet. Cell Genet. 95: 157-162, 2001. 2. Bertolino, P.et.al: Activin B receptor ALK7 is a negative regulator of pancreatic beta-cell function. Proc. Nat. Acad. Sci. 105: 7246-7251, 2008.